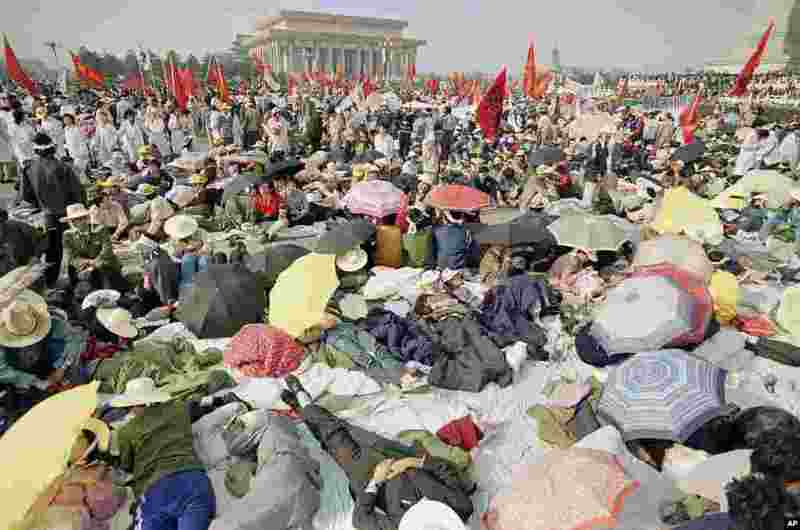 It has been 25 years since massive protests in Beijing and other Chinese cities, and China's crackdown on the pro-democracy demonstrations in Tiananmen Square. 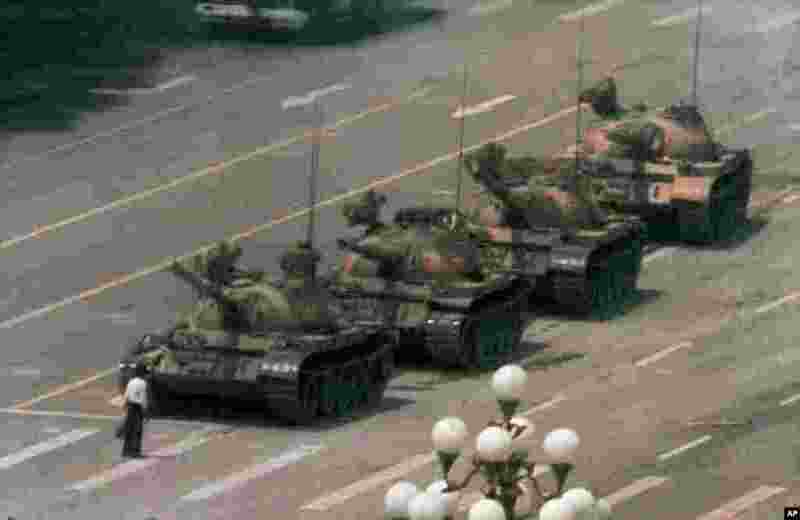 1 A man stands alone to block a line of tanks heading east on Beijing's Cangan Blvd. in Tiananmen Square, June 5, 1989. 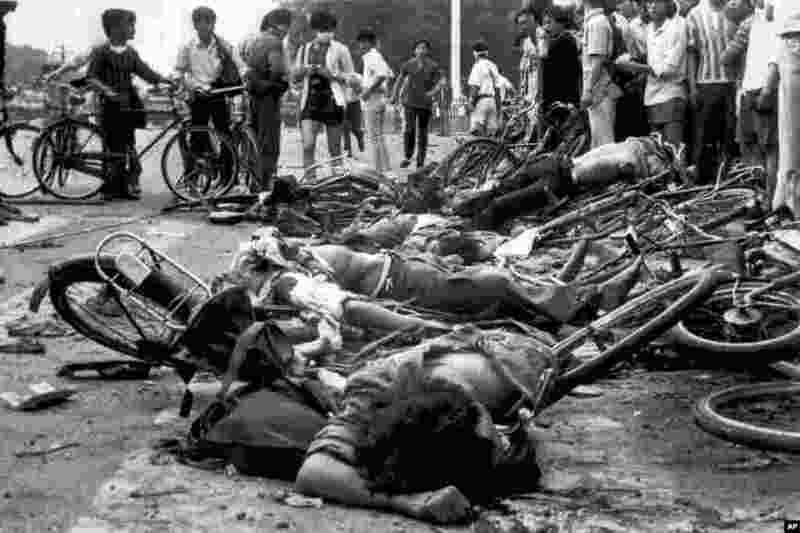 2 The bodies of dead civilians lie among mangled bicycles near Beijing's Tiananmen Square, June 4, 1989. 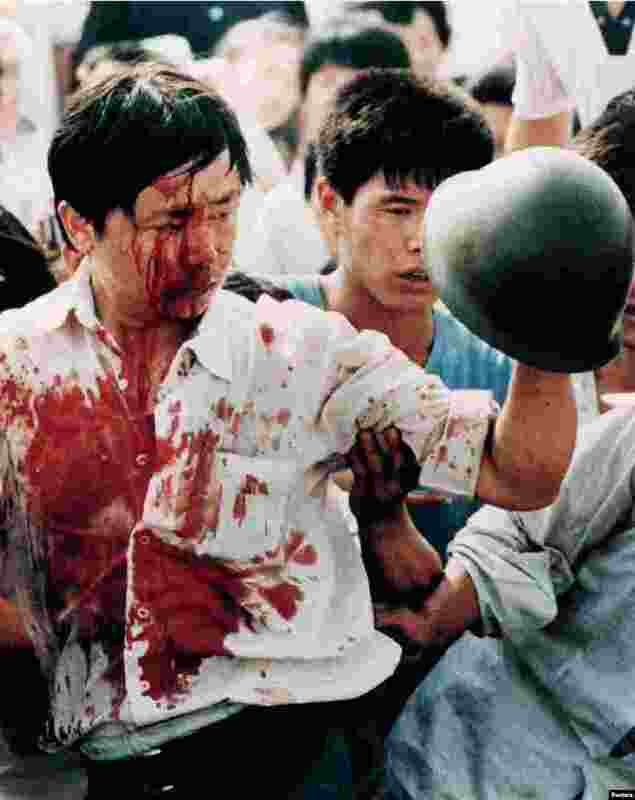 3 A blood-covered protester holds a Chinese soldier's helmet following violent clashes with military forces during pro-democracy demonstrations in Beijing's Tiananmen Square, June 4, 1989. 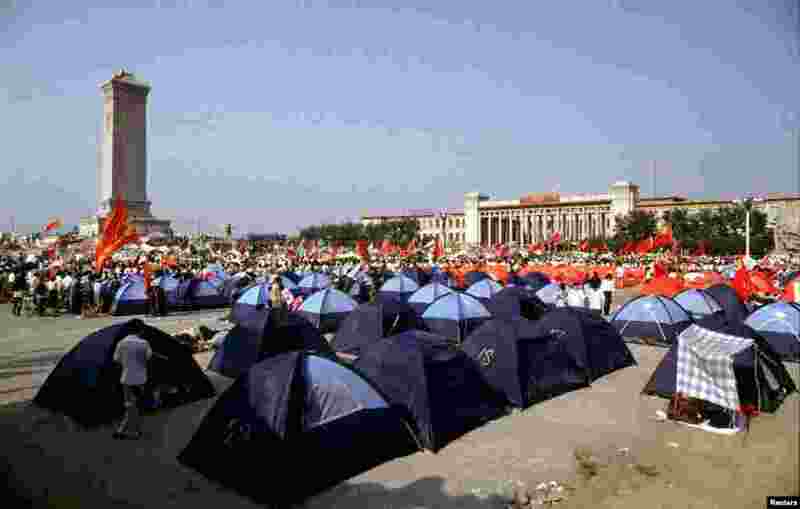 4 Pro-democracy demonstrators pitch tents in Beijing's Tiananmen Square before their protests were crushed by the People's Liberation Army on June 3, 1989. 5 A man tries to pull a Chinese soldier away from his comrades as thousands of Beijing citizens turned out to block thousands of troops on their way towards Tiananmen Square, June 3, 1989. 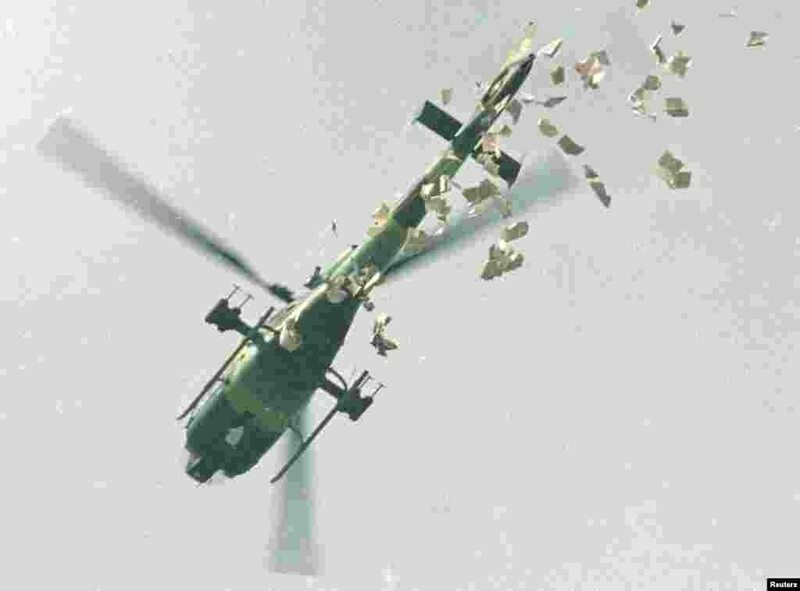 6 A military helicopter drops leaflets above Tiananmen Square, May 22, 1989. 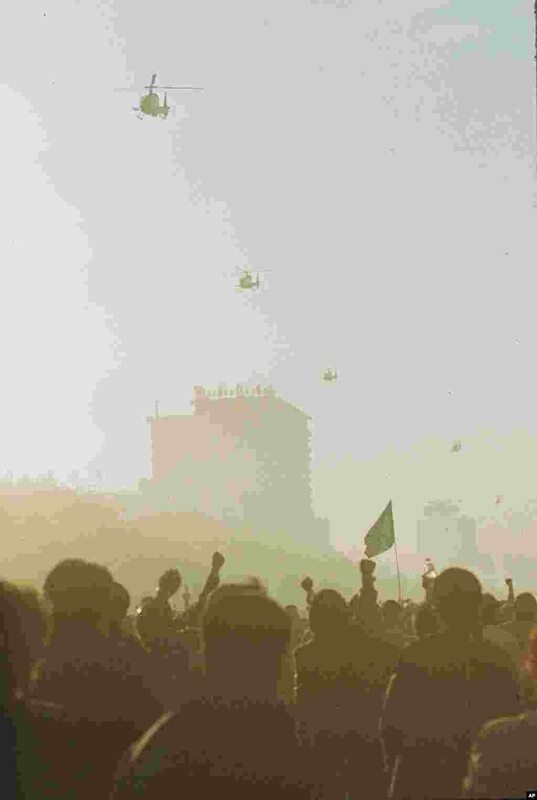 7 Beijing University students wave fists and flags as Chinese military helicopters fly over Tiananmen Square, May 21, 1989. 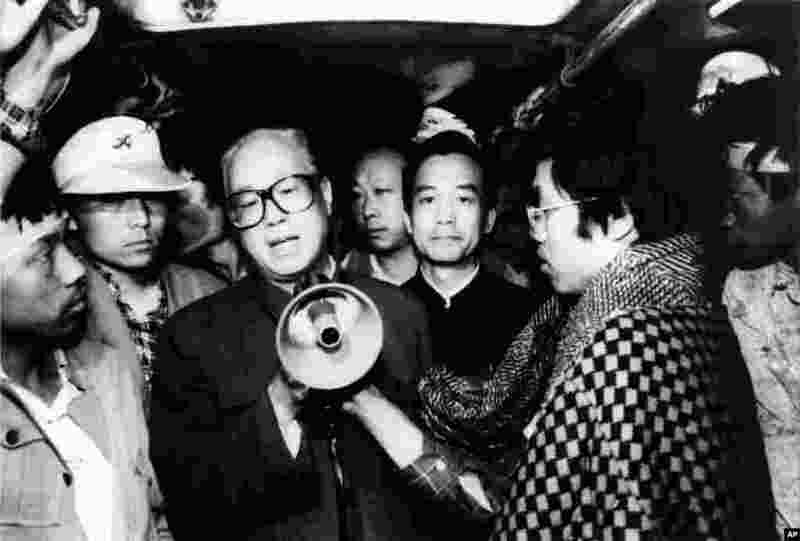 8 Communist Party General Secretary Zhao Ziyang speaks with fasting university students in Beijing's Tiananmen Square, May 19, 1989. 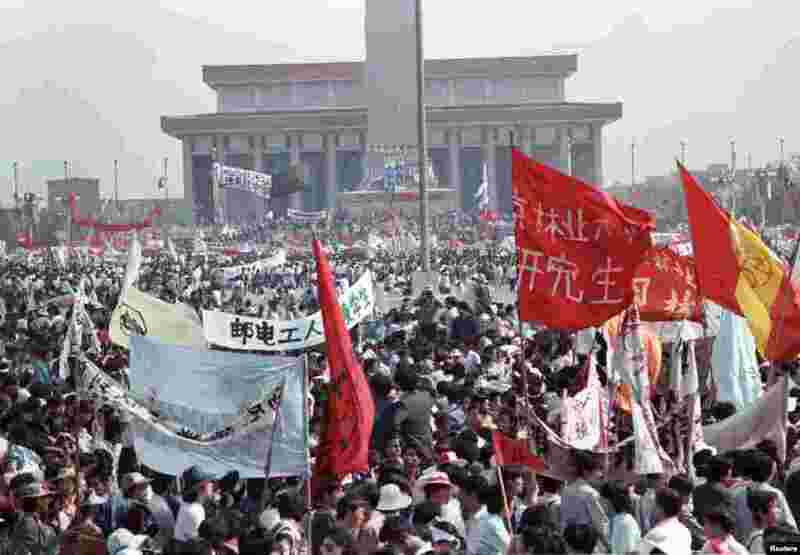 9 Hundreds of thousands of people fill Tiananmen Square in Beijing, May 17, 1989. 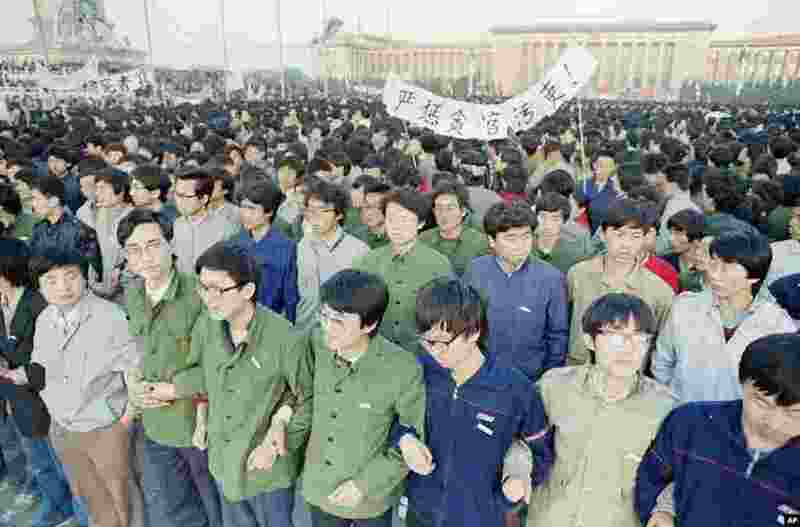 10 Beijing University students relax in Tiananmen Square as their hunger strike for democracy begins a fourth day, May 16, 1989. 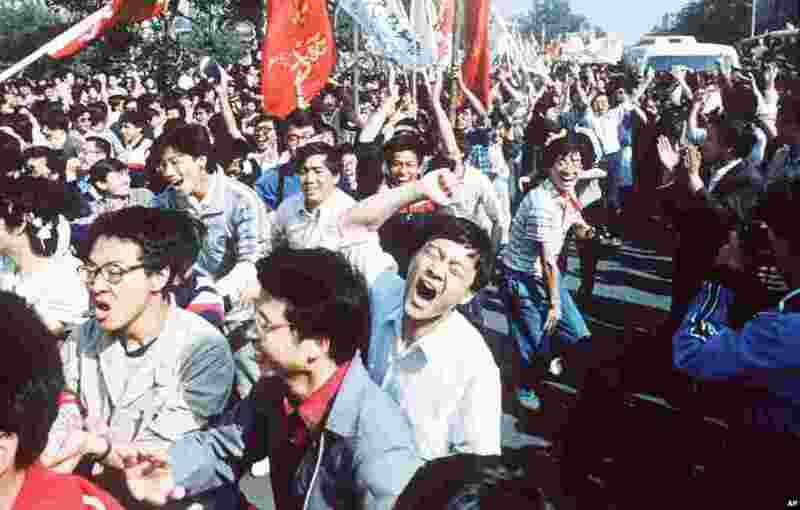 11 Students shout after breaking through a police blockade during a pro-democracy march to Tiananmen Square, Beijing, May 4 1989. 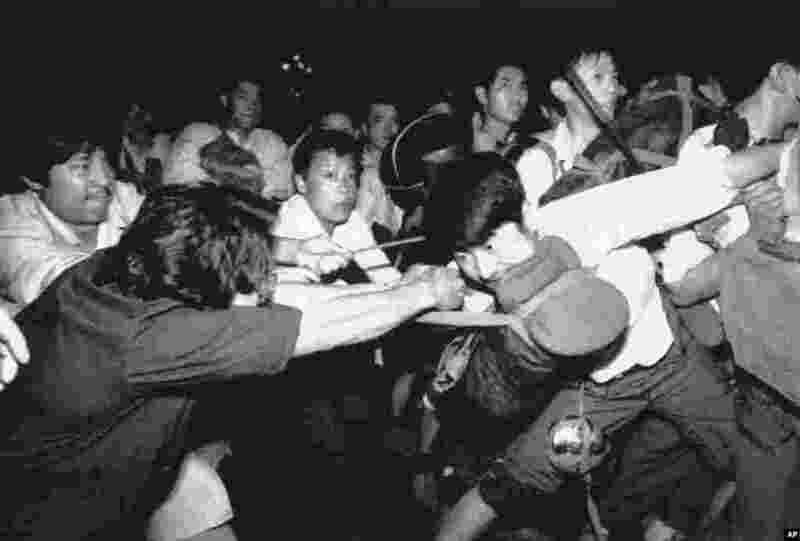 12 Student demonstrators scuffle with police as they try to break the guard line to march to Tiananmen Square in Beijing, April 27, 1989. 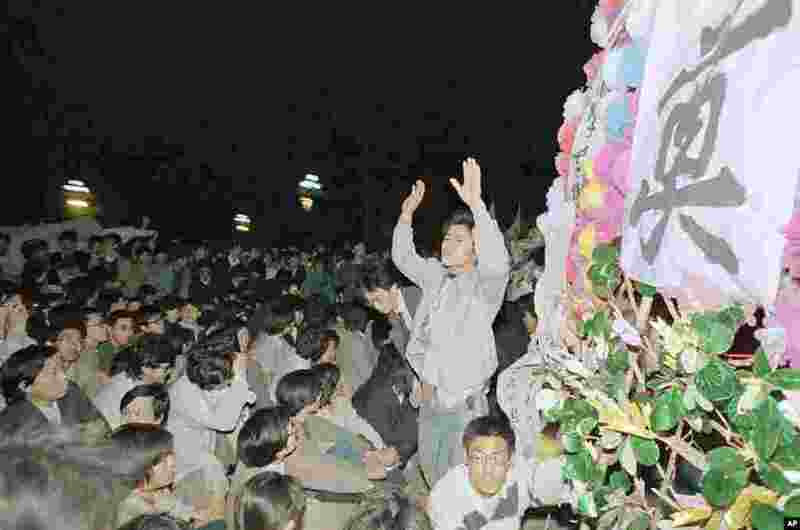 13 Chinese students link arms in solidarity at dawn in Tiananmen Square in Beijing, April 22, 1989. 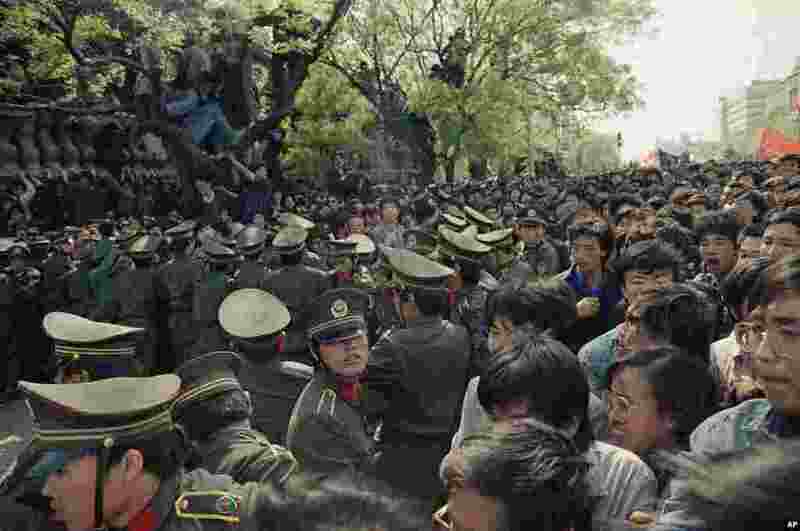 14 A student leader tries in vain to settle down a crowd of Beijing University students who converged on the Chinese Communist Party headquarters after demonstrating at Tiananmen Square in Beijing, April 19, 1989.